Onboard the Stena Spirit there is something for everyone. There's an à la carte restaurant, the Food City buffet restaurant, a large shop, a cinema, several bars, a casino, special conference rooms with lounge and bar, a night club and numerous fun activities for children are organised during the peak season. The Stena Spirit has an elaborate choice of cabins ranging from a standard inside cabin to a luxury suite with a stunning views of the sea. All cabins are ensuite with bed linen and towels provided. Cabins are also fitted with DUX mattresses for the best sleeping comfort to ensure you arrive well rested. 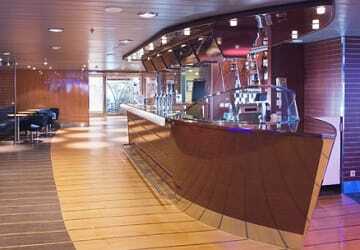 Stena Spirit has no shortage of bars. In the 'Metropolitan Bar' you can relax and enjoy the great atmosphere with a choice of alcoholic beverages, beers, wines, fresh coffee and snacks on offer. 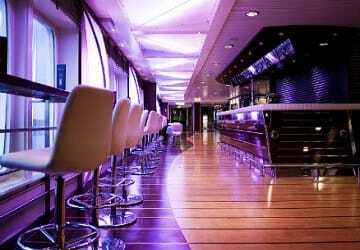 The stylish 'Riva bar' is the place to be for wine lovers with a selection of 50 wines on offer. The Albatros conference lounge and bar is open for everyone. Serving beer, wine, rolls, coffee and pastry, you can read, play a card game or just rest. Provided the weather is good, the Sun deck bar should not be missed. Enjoy the wide sea view and watch the sun set slowly behind the horizon with a cold drink in your hand. The onboard experience is completed by the C-View night club (open in peak season and during theme night evenings) which promises a night full of festivities and glamour. The Stena Spirit has a childrens play area. 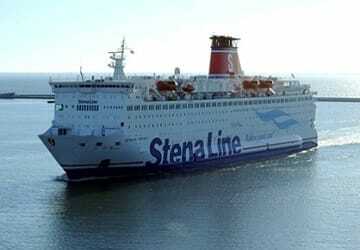 Please Note: Whilst we have taken great care in making our Stena Spirit guide as accurate as possible, onboard facilities, services and entertainment may vary depending on the date and time of year that you travel, facilities mentioned may change without notification and ferry companies reserve the right to operate vessels other than those mentioned at time of booking without prior notification. A good way to get home from the very price worthy and pleasant Sopot. Nice buffet, the spice of the trip. Ok trip. Avoid the cabins on lower deck.